Kuala Lumpur. Sime Darby Auto Performance (SDAP) introduces the second-generation Panamera today, reconciling two contrasting characteristic of a genuine sports car and the comfort of a luxury saloon. This second-generation new Panamera is advancing to become a performance icon of the luxury class. In this transformation, Porsche has systematically improved the Panamera concept – with a four-door car that has been redeveloped, down to the last detail. Its engines and transmissions have been redesigned, its chassis perfected, and its display and control concept reinterpreted for the future. The new Panamera also merges the world of ambitious sports cars and the world of comfortable cruising saloons with highlights such as rear axle steering, active roll compensation and three-chamber air suspension. The first generation of Porsche’s luxury four-door sedan made its auspicious debut in 2009. Filling the need for a distinctly Porsche vehicle endowed with space, luxury, and everyday usability, the Panamera helped open the door for a wider appreciation of the brand and its sporty heritage. Retail price of the new Panamera and Panamera 4S starts from RM890,000.00 and RM1,100,00.00 respectively. All cars sold via SDAP come with a four-year warranty and free maintenance package which includes complimentary service, parts and labour. The stated price includes all applicable duties, except registration fee, road tax and insurance. Specifications and prices are subject to change without prior notice. A Porsche has always impressed with more than just power; its efficiency is equally important. To elevate this formula to a new level, all the second generation Panamera’s engines have been redesigned, made more powerful, while significantly improving fuel economy and reducing emissions. For the first time, all of them may be equipped with a permanent all-wheel drive system and a new eight-speed Porsche dual-clutch transmission (PDK). The Gran Turismo was first launched with the two all-wheel drive model, Panamera 4S (324 kW/440 hp). This was followed by the Panamera standard model with a six-cylinder turbo engine (243 kW/330 hp). The Panamera is equipped with many standard and optional assistance systems, which makes driving more convenient and safer. The most important new systems include a night vision assistant, which uses a thermal imaging camera to detect people and large animals and displays a colour highlighted warning indicator in the cockpit. If the optional new LED matrix headlights with 84 image points are selected, people beyond the visual range of the dipped beam headlight are also illuminated briefly if they are in the computed driving corridor, allowing the driver to react even faster. The new night vision assistant is one of the assistance systems that helps to avoid critical situations in advance. New, powerful and fuel-efficient: the V6 and V8 turbo engines of the Panamera. They share a special conceptual design characteristic, which in the jargon of engine developers is known as "with the hot sides inward". Translated, this means that the turbochargers of the new Panamera engines are integrated centrally into the V of the cylinder banks. This central turbo layout yields numerous benefits, namely, the engines are more compact, and enable a lower mounting position. This, in turn, has a positive effect on the vehicle’s centre of gravity. The short paths between the two turbochargers and the combustion chambers produce spontaneous throttle response. Engine response can be further increased using the optional Mode Switch with the Sport Response Button. The Mode Switch, which was first introduced in the Porsche 918 Spyder, is an intuitively operated rotary ring on the steering wheel, which can be used to activate one of four driving modes (Normal, Sport, Sport Plus or Individual). Located at the centre of the switch is the Sport Response Button. It can be used to free up the maximum power potential of the Panamera at the press of a button. The 2.9-litre V6 biturbo engine of the Panamera 4S develops a maximum power of 324 kW/440 hp (20 hp more than the previous model); it is already available at 5,650 rpm, which is just above the nominal engine speed. Between 1,750 and 5,500 rpm, the new six-cylinder delivers 550 Nm (30 Nm more) to the drive axles. The Panamera 4S can reach 100 km/h in just 4.4 seconds (4.2 seconds with the Sport Chrono Package). With a top speed of 289 km/h, this Porsche is getting close to the 300 km/h mark. The NEDC combined fuel consumption is 8.2 – 8.1 l/100 km (186 – 184 g/km CO2). Compared to the first generation Panamera 4S, this represents a fuel saving of up to 1.0 l/100 km or 11 per cent. The six-cylinder engine of the Panamera 4S has petrol direct-injection injectors that are positioned in the combustion chamber. This injector position offers optimal combustion, maximum efficiency and very good engine response. It is also characterised by exceptionally full-bodied and authentic sound. On the Panamera, the agile six-cylinder engine drives only the rear wheels. In all models, the motor is linked to an extremely fast eight-speed Porsche Doppelkupplung (PDK). Like all other engines of the new Gran Turismo, this V6 is also a turbo engine with direct petrol injection. It develops 243 kW (330 hp) between 5400 and 6400 rpm, representing a 20 hp increase over the naturally aspirated engine used in the previous model. The exterior character of the Panamera has also been sharpened with the dawn of the second generation and is based on very dynamic proportions. The new Panamera is 5,049mm (+34mm) long, 1,937mm (+6mm) wide and 1,423mm (+5mm) tall. Despite the slight increase in height, the four-door car looks much lower and longer. This is primarily due to the reduced height above the rear of the passenger compartment – reduced by 20mm – while maintaining consistently good headroom which changes the car’s overall image completely. The wheelbase has been increased by 30mm to 2,950mm which also lengthens the car’s proportions. The front wheels were shifted further forward, reducing the front overhang and making the prestige dimension – the distance between the A-pillar and the front axle – even larger. The rear overhang is longer, giving the car a more powerful appearance. The Panamera has only grown six millimetres in width, but it feels like several centimetres. This effect is created by features such as the A-shaped air intake, which extends out to the sides and creates a completely new front-end design. At the same time, a precisely designed crossbar in the radiator grille emphasises the car’s width. The arrow-shaped bonnet over the engine accelerates this visual effect further forward and lower than before – due to the prominently contoured powerdome, whose lines now reach into the bumper. The lower front end was enabled by the new compact construction of the engines in the vehicle concept. To the left and right of the powerdome, the bonnet blends precisely into the stronger flares of the front wings – a typical Porsche design trait. Also exuding confidence is the look of the LED headlights with their four-point LED daytime running lights, of which three versions are available. The new side body – like the bonnet, boot, roof and wings – is made entirely of aluminium, and accentuates the silhouette of a sports car more than ever thanks to its dynamic roof line. At the rear, this roof line becomes the charismatic Porsche flyline – the distinctive lines that adorn all of the brand’s coupés. Two precisely executed edges on the lateral roof line visually lower the silhouette’s centre of gravity. The look of the side windows has also been redesigned: its visually continuous surface, together with its lines on the rear body, creates a stylistic affinity to the Porsche 911. Three-dimensionality characterises the doors and wings, where incident light shining on their convex and concave surfaces generates muscular tension. Integral design components there are the air exhaust ports behind the front wheels. The flared lips of the wheel arches are also powerful. The large arches provide space for the 19-inch (4S) and optional 21-inch alloy wheels. The fact that the Panamera is a four-door coupé and not a conventional saloon is clearer from the rear than from any other perspective. The ‘greenhouse’ – made up of the roof, roof pillars, and window surfaces – is supported by a powerful and broad shoulder section. Clearly a Panamera, definitely a sports car. The most prominent components identifying the rear body are, without a doubt, the three-dimensional LED rear lights with integrated four-point brake lights. The rear lights are interconnected by a narrow LED strip. All of these elements together create an unmistakable night design. Integrated seamlessly and elegantly into the boot, which features electric opening and closing as standard, is the extendible rear spoiler that is now finished in body colour. The Panamera 4S can be recognised by their round tailpipes. Image materials are available in the Porsche Newsroom (http://newsroom.porsche.de) and, for accredited journalists, in the Porsche press database (https://presse.porsche.de). Sime Darby Auto Performance Sdn. Bhd. 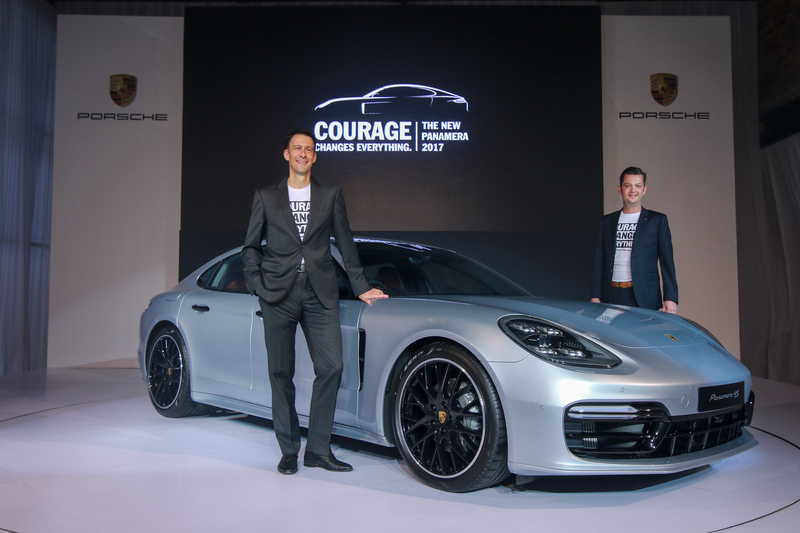 (SDAP) is the authorised importer of Porsche vehicles and parts in Malaysia. Established in 2010 as a member of the Motors Division of Sime Darby Group, SDAP also distributes and provides after sales service for Porsche vehicles in Malaysia.